We have a come up with an exclusive range of Anjeer Kaju Katli Gift Hampers to our valuable clients. 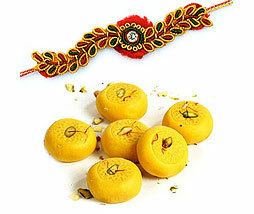 The hampers offered by us include fresh and delicious sweets that are well decorated as per festival requirements. We are offering a wide variety of attractive Ashirwad Rakhi Hampers, which are especially designed to cater the demands of customers. These hampers are sourced from well known vendors, which are simply ideal for festive seasons. 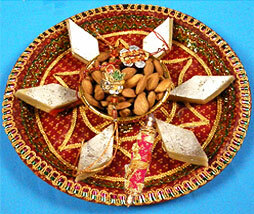 Our company is engaged in providing a broad range of Kaju Katli Rakhi Gift Hampers. These hampers are highly appreciated by our clients for their amazing packings, colour combination and gift items. The sweets offered in this hamper are hygienic and fresh. 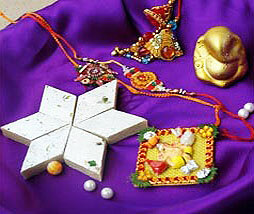 We bring a specially made designer Rakhi Thali , which include Roli, Tikka, Sweet pieces, gift items and Rakhi threads etc. This is a special gift that has great moral values. 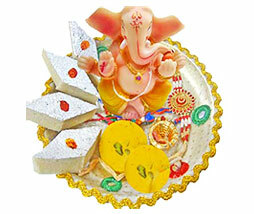 The hampers offered by us are available in various customized forms to cater the requirements of clients. We are engaged in offering a superior range of Special Masala Peda Gift Hampers that are made in compliance with our client's requirements.